Globetrooper.com is a “a tool for adventurous travelers to create trips and invite people from all over the world to join them.” First off, the site is beautiful (I am unabashed snob when it comes to this; If the colors make me cringe and graphics make me laugh, I’m gone). The fact that I was prompted to divulge my global travel “bucket list” when setting up my profile made me smile (if you’re interested, a long private yacht cruise to a private island in an uncharted sea tops my list). They also have a highly informative blog with great “How-to” articles, my favorite being “How to Get the Government to Pay for Your Next Round-the-World Trip.” Also useful, when scanning adventures other wanderlusts have potentially invited you to join, they rate the trip in terms of difficulty, culture shock, remoteness, and risk--important factors when vetting a potential travel partner. So, who’s up for a medium-difficulty, semi-remote, low risk, big culture shock trip? Egypt tours , India tours and Turkey are next on my list! Want to know more? Read my interview with Globetrooper.com cofounder, Lauren McLeod, below. Global Basecamps: So, how did GlobeTrooper.com begin? What was the inspiration? Globetrooper: The concept of Globetrooper.com only came about in December last year when Todd and I decided that we wanted to start a business but also wanted to pursue our passion for travel. We started brainstorming ideas that would let us work remotely and then realised we could combine the two and start a travel business. The inspiration came when we wanted to climb Mount Kilimanjaro with a local tour company and were trying to find others to join our expedition. We asked all of our friends and family, posted numerous threads on forums and looked everywhere on the internet to find people who wanted to climb with us. We eventually found one other person and were able to swap stories and encourage each other up the mountain. We had the best experience with him and thought that there had to be a better way to find travel partners. Global Basecamps: It must be very satisfying when you help facilitate a group of strangers coming together for amazing travel experiences. Are there any success stories you can share? Globetrooper: The website was only launched in March this year, so it's only now that a lot of the trips are starting to head off. We've seen quite a number of people joining the more unique trips, two of the most popular are Gobi 2011 and the Great Circular Indian Railway Challenge . There are 5 people now confirmed to travel on both of these trips, and over 20 interested. Both of these are next year though, so we're yet to see how much of a success they will be. There's also been quite a number of smaller trips where 2 or 3 people have joined up that we have yet to hear the outcome of. Global Basecamps: What is your vision for the future of GlobeTrooper? Globetrooper: We have a lot of ideas and are trying to change to the needs of the Globetrooper users. We first built the site thinking that people will post up an idea for a trip, then collaborate on the itinerary with with someone interested in doing the same thing, and off they go together. However, we've seen a shift towards people posting their trip and then wanting to meet up with people along the way if a time & place matches. We're busy building this meet-up type feature at the moment and hope to launch it within the next month. Global Basecamps: Your site reads, "There’s nothing wrong with hopping on a plane and only visiting tourist attractions; it still beats watching TV at home. But the real magic of world travel is living and learning with local people. You will be surprised how much you can learn from them." We couldn't agree more. What are you doing to help facilitate travel for both the travel novice and expert? Globetrooper: In addition to the Globetrooper community talking about trips, giving advice and chatting on the forums, we've written a travel guide about the different regions of the world and trip ideas for those who don't know where to start. 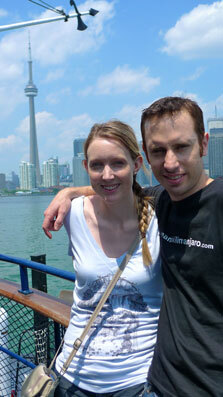 We also constantly writing for our blog, Notes of a Globetrooper, about our experiences and travel in general. The blog especially caters to those planning their first trip overseas and those who are extensive travelers, with posts from Things To Do In Sydney to The Science Behind Mountain Sickness. Global Basecamps: We also resonate with this statement, "...self-planned travel (often using local guides) gives you the flexibility to really encounter the unknown. Unlike packaged travel with fixed itineraries, you can go where you want, when you want, with whomever you want." Even though Global Basecamps is a travel agency, we partner with only the best local guides, involve clients heavily in the planning, and always encourage them not to book out every day to allow for that precious flexibility, which inevitably leads to adventure. That being said, our travel agents struggle at times to get clients to take that approach, instead opting for packed itineraries. What do you think the key is to "letting go" of travel planning anxiety? Globetrooper: I've always found that planning is part of the fun of travel, but it also creates stress. Additionally, if planned too meticulously, those spontaneous adventures can be missed. I agree that you need to be a little lenient with your planning, trying to squish so many things into one day isn't nice, you usually regret it on the day and then opt out of a few things. Most people only have 2 or 3 weeks of vacation time per year, they want to pack as much into that time as possible, but they end up returning home needing a vacation from their vacation. In my experience, the key to 'letting go' of the anxiety of travel planning, is to do the fun research first about what you want to see and do, but don't plan an hour by hour schedule. Get everyone in your group to list the things that they want to do the most, buy the essentials like flights and a few nights accommodation, then decide what everyone wants to do when you land. Plus once you're in your location, you will find an abundance of things to do that you hadn't thought of. Global Basecamps: Personally, what is your most memorable travel experience? 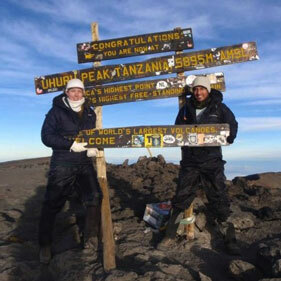 Globetrooper: My most memorable experience is summit day on Mount Kilimanjaro. We went to sleep early to wake up only a few hours later at 10pm to start our last ascent an hour later. It took us until sunrise to reach the peak, and it wouldn't have happened without our two guides and two strongest porters. They serenaded, whistled, and made jokes, all the way to the summit at 5,895 metres… the Roof of Africa. Then came the steep descent down the mountain that nearly killed me. Think about it, you take 5 days to get to the summit but only 2 days to get down. I think we covered a distance of around 20km coming down the mountain on summit day. Global Basecamps: Is there anything else you'd like the online travel community to know about Globetrooper.com? Just to give it a go, that is to travel with strangers. They're not strangers for long. We've found that our most treasured travel memories are those shared with others. You can get involved by registering on the site , you can then create your own trip, follow someone else's that sounds interesting, or chat in the forums. Or we're also sharing a lot of info about trips and travel on our Facebook page and Twitter account.